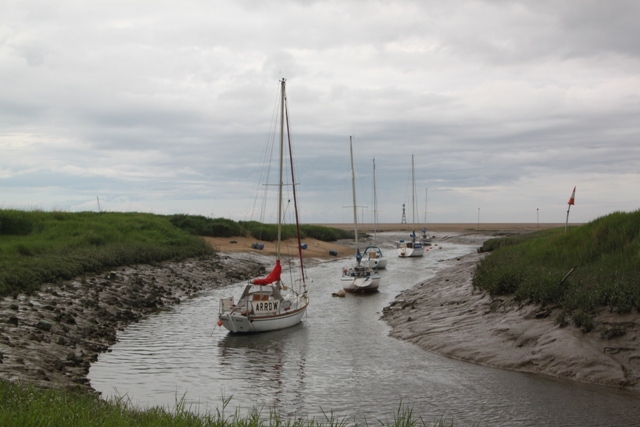 The River Alt meant not a great deal to me, until a few weeks ago that is when we hiked along its estuary. 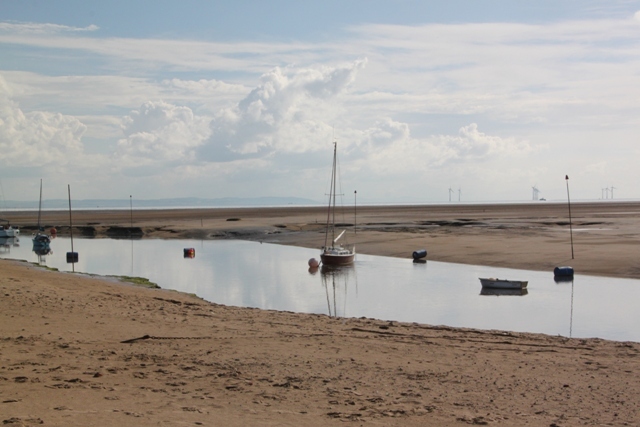 It is actually Liverpool’s second river but more importantly for us is the most stunning spot for a stroll. 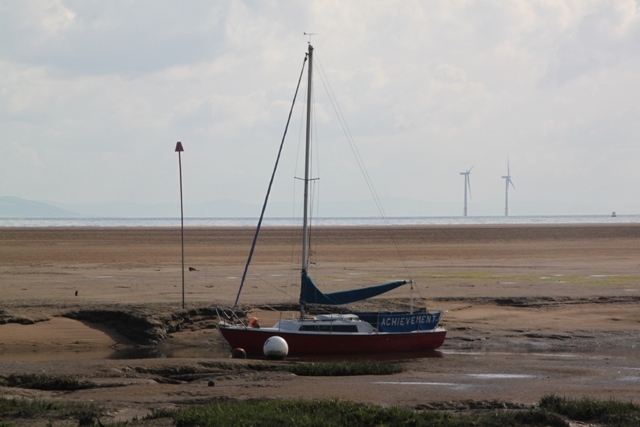 Our walk started at the river estuary in Hightown, took us past pretty little boats and by the riverside, across some mighty sand dunes and ended up at Crosby beach. Three miles there and three miles back, all (mostly) flat and easy, except if, like Son, sand dunes mean that you just have to get climbing. 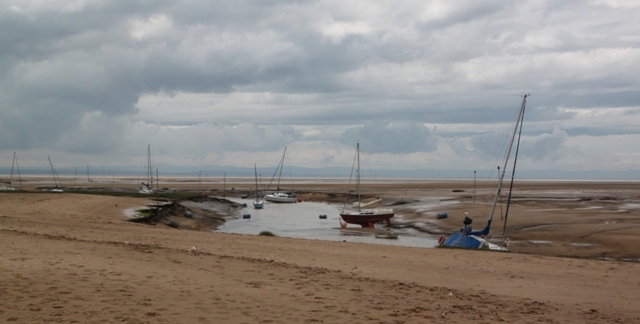 Lovely views, a golden sandy beach and something interesting at every turn – we loved it. Apparently the river is a great spot for bird watching – normally not for us, Son is not very quiet, not very patient and not very good at sitting still so we tend to spot not very much. 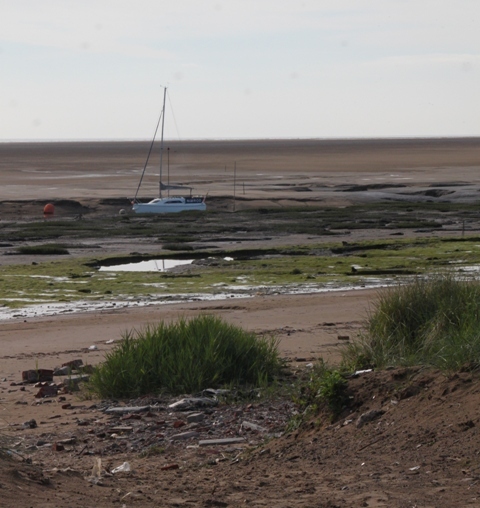 We did see a lot of wildfowl here though, Altcar Rifle Range is nearby so the birds don’t seem to mind a bit of noise and loudness. We spotted a red flag flying – apparently this means they are practising – and did hear the sound of gunfire. Low tide at the start of our walk, we found hundreds of rocks strewn with seaweed. These are the remains of an ancient forest swamped thousands of years ago when sea levels increased. 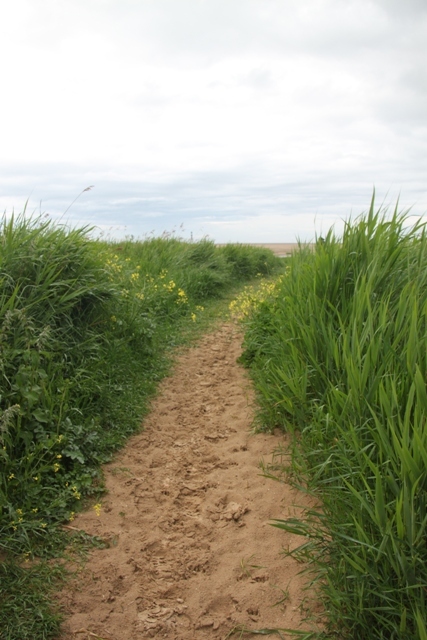 Further along the river, to Son’s glee it was time to head up into the sand dunes. 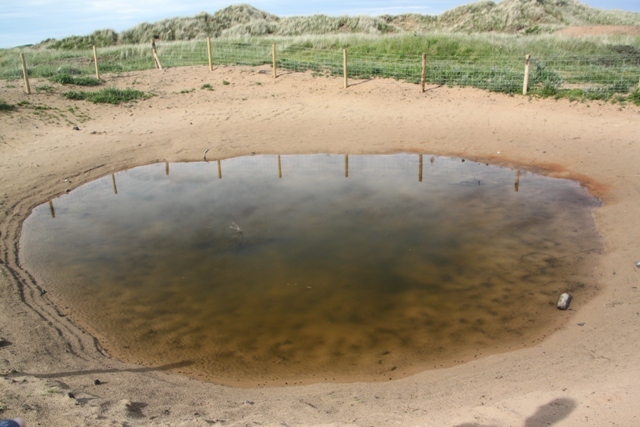 Marker posts show the main route so you can’t go wrong, we stopped off to have a look at the natterjack toad ponds. Son was very interested but you can’t get too close, the toads are a protected species. 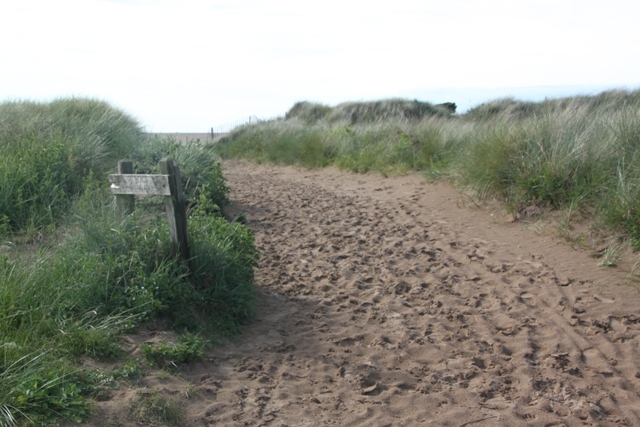 As well as the stunning dunes, we spied lots of bumps on the landscape. Apparently when Liverpool was bombed in World War II huge areas of rubble had to be cleared and some was taken here. Now it is grassed over, but you can see the undulations very clearly – perfect for boisterous children to burn off excess energy. 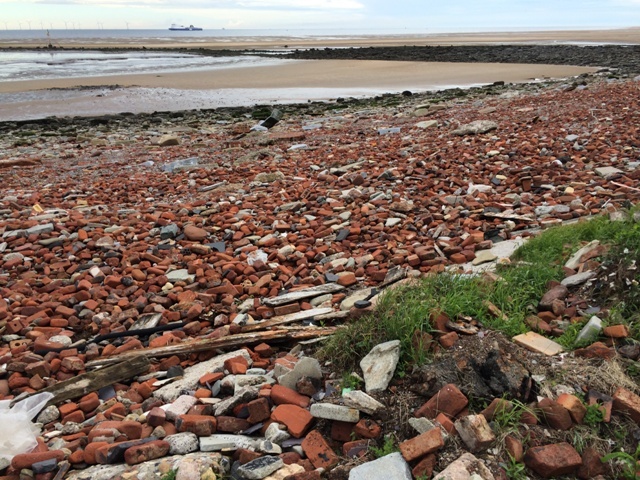 Down on the beach we found lots of rubble and interesting bricks – I assume this was all part of this rubble clearance. The males in our family found it endlessly fascinating and could have spent the whole day, climbing over the rubble in search of “special” bricks. They did find a lot – I had to use extreme persuasion skills to avoid them returning home with us (the bricks that is, not the males!). 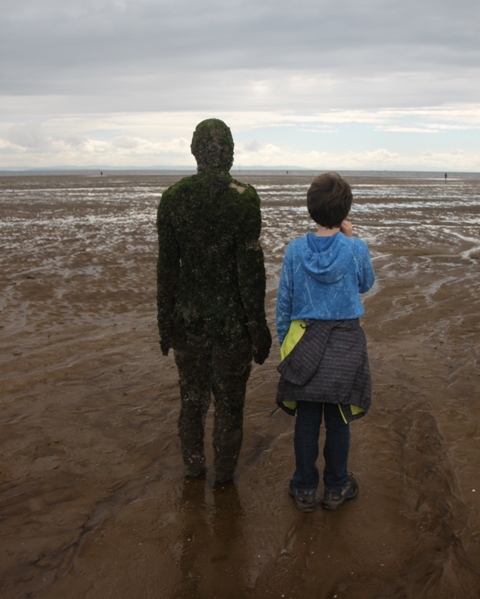 Before we knew it, we were at Crosby Beach and found the famous iron men sculptures. 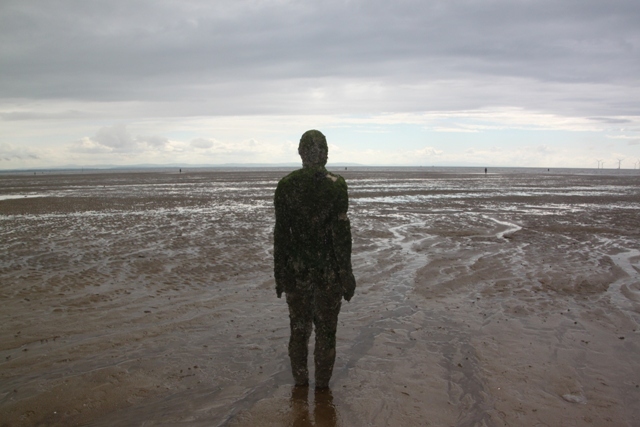 “Another Place” is by Antony Gormley and is fascinating. There are 100 cast iron “men” along a 2 mile stretch of beach, all staring out to sea. These were made from casts of the artist’s own body and standing 6 feet tall are intriguing and a bit unnerving. 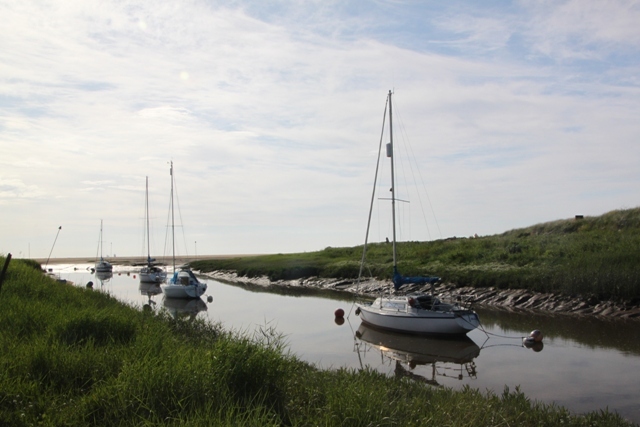 The tide ebbs and flows and reveals and submerges the sculptures. The area around them is muddy and has a lot of soft sand but we did manage to get up close and personal with a couple. Covered with seaweed and barnacles they are quite something. 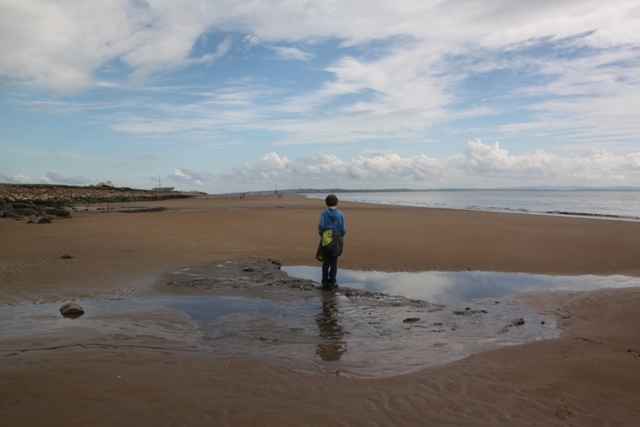 Son was fascinated here too, we watched as the tide came in and some of the “men” gradually disappeared. Back through that rubble again, back across the dunes, back to the river where we watched the most glorious sunset over the estuary. A gorgeous spot and a gorgeous walk. Thanks Suzanne – it was a glorious day which helped with the pictures. The walk was stunning! Love your blog! Out of interest, how long did the walk take you overall? Thank you!! We started the walk around 2ish and finished about 5ish I think. You could do it a lot quicker, we climbed the dunes and took a lot of detours. 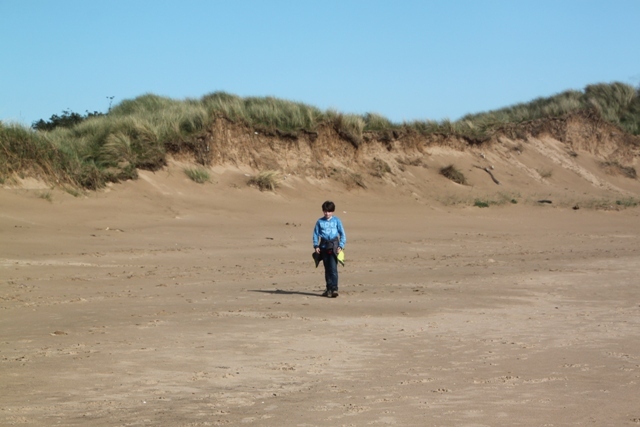 My son also likes to head off exploring so that takes a fair bit of time too!! What a great trip! Thank you for this enormously interesting and insightful information. I got goose bumps when I read about the iron men. Didn’t know about that! It was a lovely day out Erika, the iron men are really interesting but a bit creepy too!! I love how you three get out and move and see the surroundings! And I love that you share it with us! Those statues would kind of creep me out a little I think (especially in the darkening of the evening I think). Still so beautiful and cool though. Sometimes with our son it’s easier to get out than stay in and be driven round the bend with too much excess energy!!! The statues are creepy enough during the day, no way would I go there at dusk!! Thank you!! I know what you mean about those statues, I wouldn’t like to go there alone at dusk…. definitely the stuff nightmares are made of! 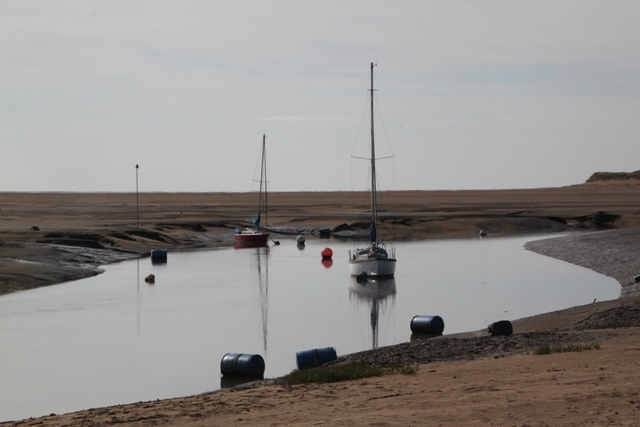 The iron men disappearing in the water sound… hmm, scary? Interesting idea to sculpt? Something definitively to explore while there. Since we don’t have any tide to mention, I am always very fascinated by the huge difference it can make. Good day trip! It was totally fascinating to watch the tide come in and see the “men” disappear – something about the sea and the tide just captures your attention for sure. The men disappearing, yes it is definitely a bit alternative and strange but good to see!! I still remember when I as a kid for the first time saw the tide come so I believe you!! Wow, I don’t know what to think about those statues – unnerving is a nice way to describe them! Thanks for sharing another great post, Joy. Love the photos! Thanks Anna! Yes, they’re a bit weird but compelling too, not what you expect to find on the beach! This loos gorgeous! I’ve never heard of that river before. 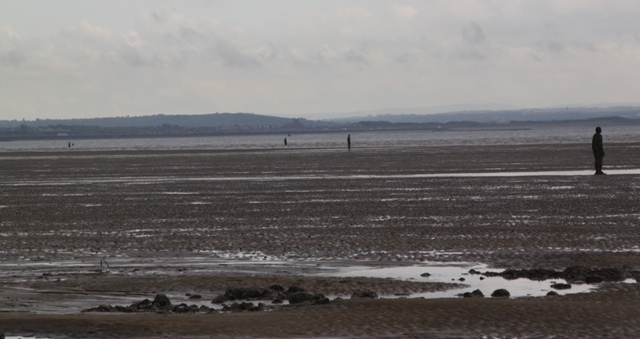 I’ve seen pictures of Anthony Gormley’s men but didn’t know, or had forgotten, where they were. Very atmospheric. The only Gormley I’ve seen up close is the Angel of the North which I think is terrific. I love the Angel of the North too – we were in the North East at Easter and made a detour to see it up close, it was fantastic. These are different but no less fascinating and the scenery around the river is stunning! Rereading my comment – I meant, of course, looks! Love the photos of the boats on water. Also completely understand the fascination with the bricks. The husband would have done exactly the same thing! It’s a beautiful spot for sure. 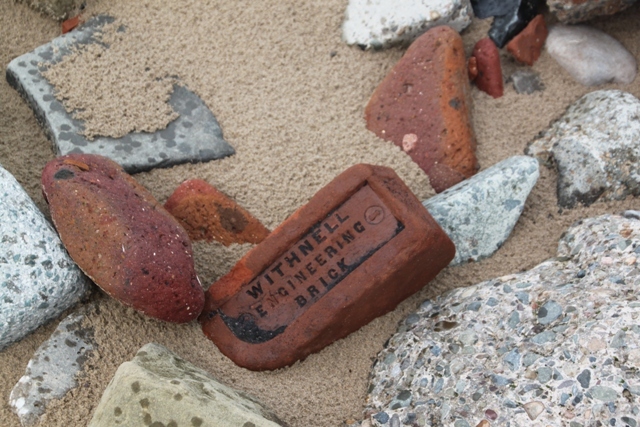 The bricks were interesting, especially given the story behind how they got there. Lots had names/house numbers and other things on them so intriguing to think of the story behind them. 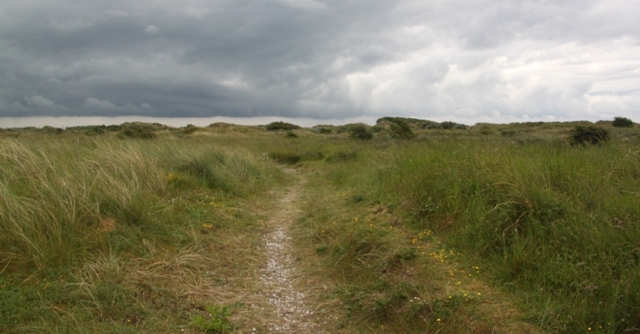 The dunes are stunning and great fun to climb and slide down!! We enjoyed seeing the iron men up close, although they are a bit weird for sure. I just moan and groan a lot Melissa, no special technique, just try to wear them down!!! Excellent! I’ll have to give that a try. It seems like a lovely place to visit! It’s definitely unique! Great pictures! 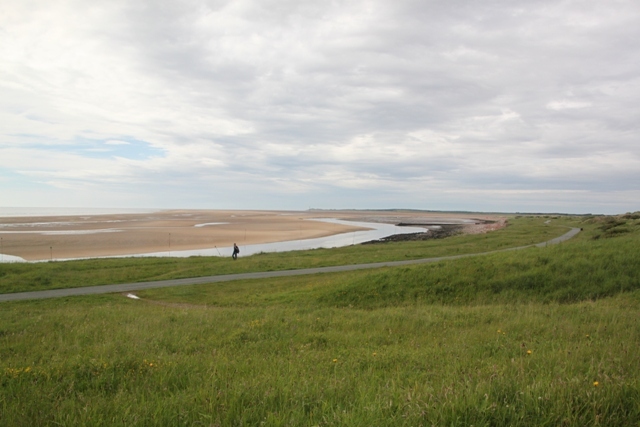 It is Caryn – beautiful scenery and lots to take in as well, we had a great walk. I never knew about those sculptures. They are so neat! Although, if you did not know about them and just came upon it, I imagine they would seem quite eerie. Thanks for sharing! They definitely would be Lauren – especially at dusk!! They are great to see (when you know about them in advance) though!! Thanks Rosemary – we didn’t know this area at all and were so thrilled to find it was so beautiful. The highlight for our son though was of course those men! !